The case of Watson v. American National Prop. and Cas. Ins. Co., No. 2:15-CV-00888 (W.D.Pa. Sept. 11, 2015 Schwab, J. ), involved a class action matter based upon an on alleged invalid UIM/UM rejection form. By signing this waiver I am rejecting Underinsured Motorist Coverage under this policy, for myself and all relatives residing in my household. Underinsured Motorist Coverage protects me and relatives living in my household for losses and damages suffered if injury is caused by the negligence of a driver who does not have enough insurance to pay all losses and damages. I knowingly and voluntarily reject this coverage. The form required by the Pennsylvania Motor Vehicle Financial Responsibility Law, 75 Pa.C.S.A. Section 173, does not contain the word Motorist in the second sentence. According to the Opinion, the Third Circuit had previously decided a case with exactly the same addition to the form, and concluded that it was a clarifying word and therefore did not invalidate the form. Judge Schwab concluded that, since the language in Third Circuit case was identical to the language at issue in this case, he would follow the Third Circuit’s decision and, as such, dismissed this case. 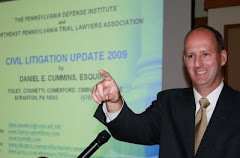 I send thanks to Attorney Sheila M. Burke of the Pittsburgh law firm of Burke Cromer Cremonese, LLC for bringing this case to my attention.